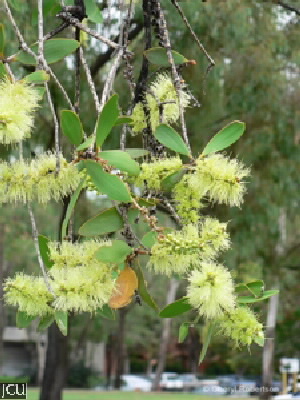 Common around Townsville this small tree can be recognised by the broad thick lanceolate leaves to 22 cm long and up to 7.5 cm wide, 5-9 longitudinal veins, appressed silky hairs present on young leaves. Flowers in dense creamy-green spikes with staminal filaments 18-23 mm long. Fruit is a capsule 4-6 x 4-6 mm. Red flowering forms occasionally found. Grows well on soils that are seasonally waterlogged.